I love a good Bergére chair. I think they are actually the ideal piece of furniture. They are stylish and comfortable. More cozy than an arm chair yet not like some upholstered chairs that practically swallow you when you sit down! For that reason, I would say they are more conducive to a living room than a family room. You can sit in them comfortably, yet still have a conversation. In a family room, you want to sink into your chairs! Of course, I love the antique ones the best, however, there are many retailers selling them now with chippy/distressed finishes so you can always get that antique look if you want it. They look great in almost any situation. 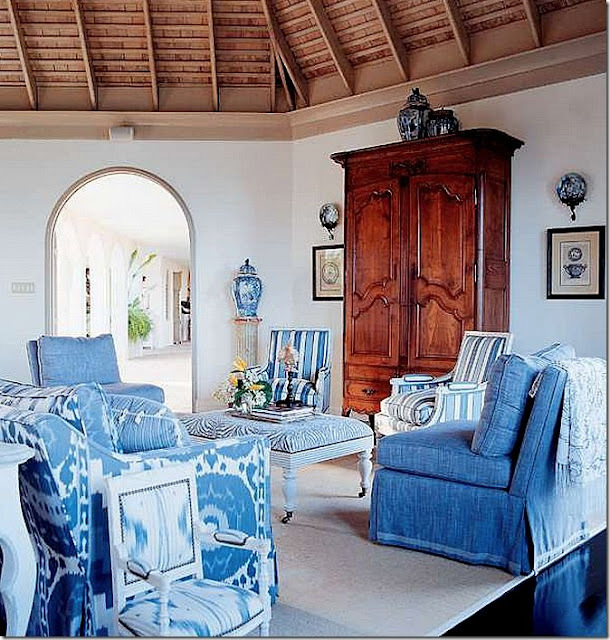 They work with traditional interiors, of course, because they are traditional. But they also look amazing in more modern settings and/or mixed with modern furniture. 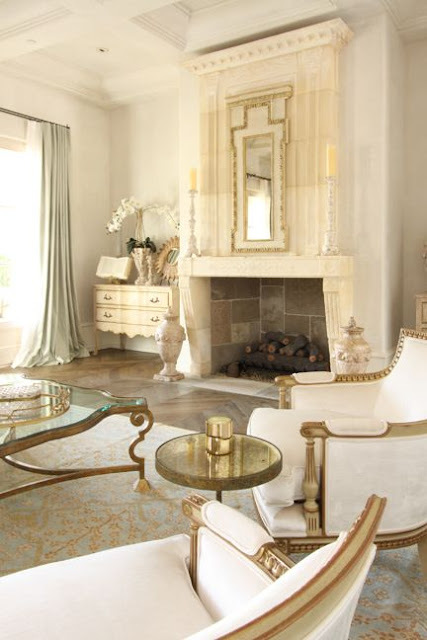 Love them here mixed with a modern gold table. Here one is used in a little girl’s room – how cute is this?! 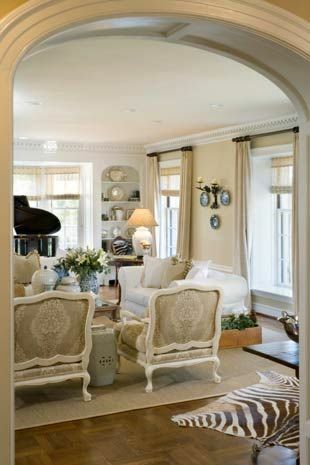 This living room has a mix of antique and modern and the Bergére works beautifully! The always amazing Gerrie Bremmerman uses them often. 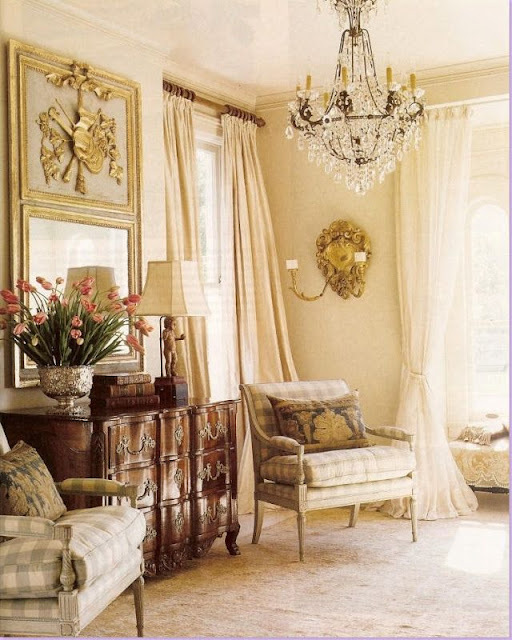 Love them here in a French inspired room upholstered in a check. 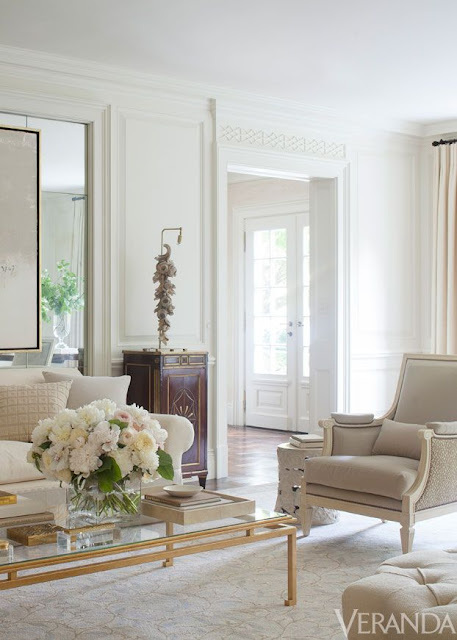 This room is more transitional than traditional, and I love that the frames are gold! This has been pinned and re-pinned about one thousand times – it’s that gorgeous! Eleanor Cummings mixes them with other French antiques and covers them in an amazing floral fabric. This antique one is just gorgeous with it’s extra wood down the back. 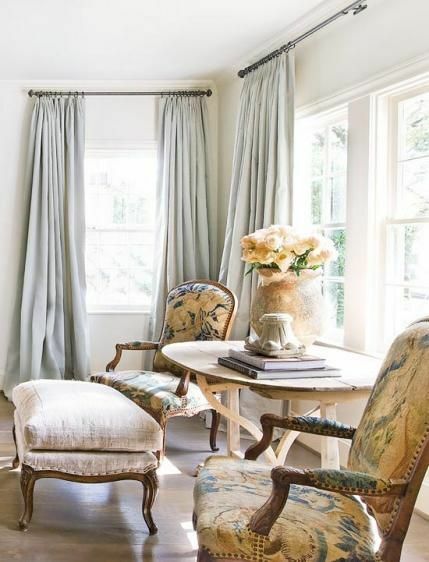 This room has antique and modern elements, yet the chair works perfectly. 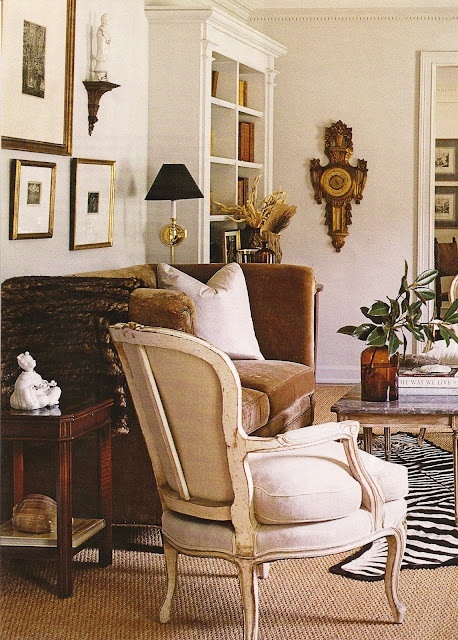 Love the zebra rug! 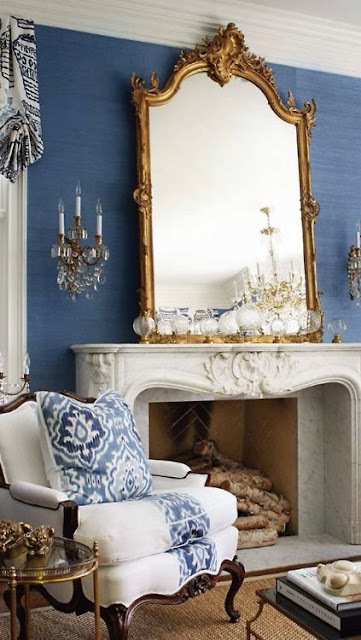 This one with a bold patterned stripe is interesting, especially when mixed with such a beautiful and formal mantel and mirror. I love this whole room! Great mix of styles. And the Bergére’s frames are white but upholstered in a darker grey. 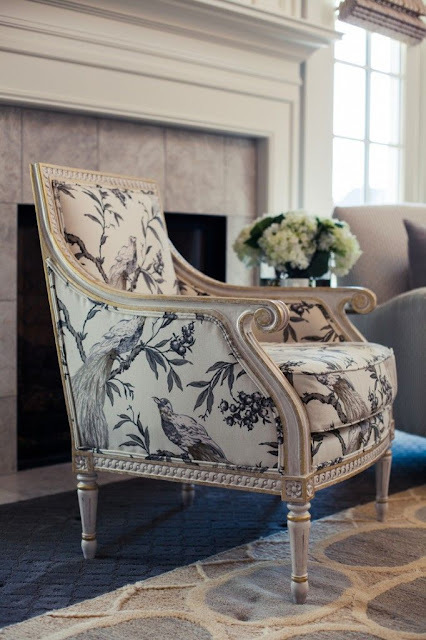 The other great thing about a Bergére chair is you see the fabric from the back. How pretty is this!? Love it in this bird pattern!! I recently found my Bergére at a resale store. Unfortunately, it’s not a French antique, however, it was a steal! I still need to recover it, but I love the lines of it and the simplicity. Many of them have carvings of flowers and other things at the top, however, this one is a simpler version and I kind of like that. 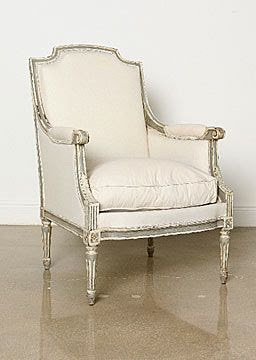 As I said earlier, the antique French chairs really are the prettiest, but obviously, they are also the most expensive. Several retailers, Ballard Designs, Horchow, and Wisteria, to name a few, do a really nice Bergére at a decent price. Or scout a resale or consignment store! And if your taste isn’t as traditional, try mixing it into a more contemporary or transitional space but using a brighter or bolder fabric. They look great in leopard, or zebra, or even bright velvets! The sky really is the limit with these, they are that adaptable. They are great for smaller living rooms too, like apartments. I absolutely agree. 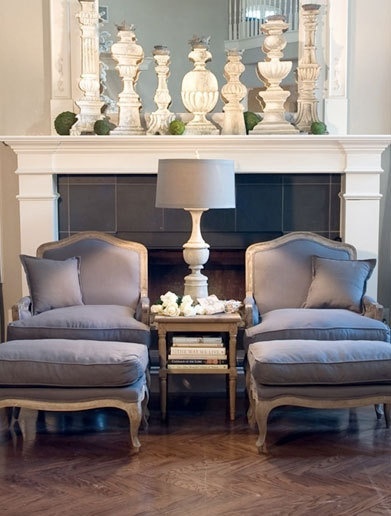 Bergeres are an ideal mix of style and comfort. The American furniture company Hancock & Moore sells a chair called the Balfour chair that is really pretty, and for a non-antique, albeit slightly expensive option, I think it's lovely. 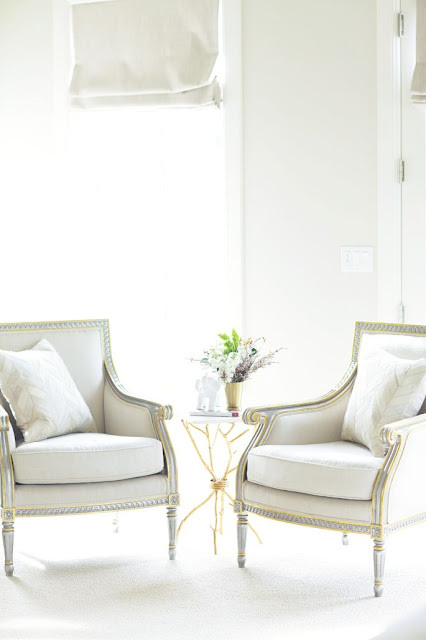 I have two small Louis XVI-style chairs (or is it XV– I can never keep my Louis' straight) from Hickory Chair that are really comfy for their size and can float anywhere in the house. I'll probably keep them forever. Great post! P.S. Have you ever been to Gerrie's New Orleans shop on Magazine St? I was across the street from it this year, but with kids in tow, I didn't go in. ?